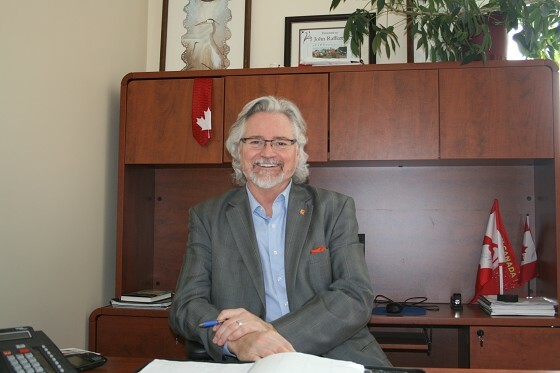 John Rafferty, MP Thunder Bay Rainy River Enjoys His Job! Were you born in Thunder Bay? I was born in Wingham, Ontario a farm community near Kitchener, Waterloo. My father worked in radio there and then moved to TV in the 50’s. We lived there until I finished university at the University of Waterloo and then attended the University of Western in 1979 graduating with my degree in education. After that I worked in Africa for 5 years with WUSC (World University Services Canada) as a teacher. There weren’t many teaching jobs in Canada so I went to Africa and that was fun. I came back to Canada, got married and we both got jobs in Yellowknife and was there for 5 years. When we were in Rankin Inlet I was working as a principal and got a call from WUSC, ironically when it was a whiteout. They asked me to go back to Southern Africa to work, which we did. After that we came back to Canada ending up in Thunder Bay. My wife got a job at the library here and I went back to Confederation College and took the broadcast program. You worked in broadcasting in Thunder Bay for several years before entering politics? I did a talk show in the afternoon on CKPR and was there for 5 years until I decided to run for political office in 2000 starting first in Thunder Bay Superior North in the Federal election because at that time I lived there. I also ran in 2003 provincially, 2004 and 2006 federally and in 2007 provincial when we had the recount here. In 2008 I ran federally and won and in 2011 won reelection. It takes a while to build following in Northern Ontario. I think the people here are careful about their votes and where they go. It has been traditionally Liberal so you just have to knock on doors and meet as many people as you can. Over the course of the times I ran I have probably knocked on every household in the riding, which total about 37,000. I worked in between elections as well and would knock on doors on the weekends. If I was going to get into politics I put a time limit of ten years and would put my all into it. I enjoyed the work, as the best part of politics is meeting people. If I get to go to a 100th birthday party on a Sunday afternoon that is great. Why did you choose to get into politics? On my radio talks show we talked a lot about politics. One day a guy phoned me up and said, you’re so smart why don’t you run if you have so many opinions about the politicians. I thought maybe I should do this. The NDP was the party I belonged to. I worked on a provincial campaign as a high school student 40 years ago. At that time I did a paper on my experience in the election then. I like the social responsibility of the party. What is a typical week like for you John? I am in Ottawa from Monday to Thursday or Friday’s usually halfway through the day. You are then in the riding and go back late Sunday or early Monday. I have my committee, Public Safety and National Security with a strategy session for the week on Monday. It is a committee of all parties where we look at all the legislation that comes to us including budgets on say topics like borders. The Minister will come to see us sometimes. The bulk of the work of parliament gets done in these committees. We also all have duty days when we have to be in the house sometimes until 7:30 pm. Our party does 1/2 days. In the house there are bills, debates, question period and statements. I can ask a question or make a statement sometimes. I recently had a question on EI because we have had a lot of people coming in asking about EI. Last week I had a statement on pensions relating to the Resolute workers in Fort Frances. You can also speak if a bill interests you and it helps to put your riding on the block. It usually is a 12-hour day with phone calls to answer at the end of the day. Sometimes constituents visit me in Ottawa. We do some charity event where I have supper with someone who has bid on a dinner with me and they also get an inside tour of the parliament. How about your schedule in the riding? In the riding the days are pretty full. Most people want to see me on Friday in Thunder Bay but Saturday and Sunday if people want to meet. I will drop in on events in the riding like the Outdoor Show. People like to see you as they may not email or phone for an appointment but when I am out at these events I hear lots of things from people that I have met casually. I get most of my feedback when I am at these types of events. Also every month I send out mail outs that are covered in our budget and we gets lots of opinion that way. It is an avenue for people to talk about things that concern them. A good example is the Kakabeka Legion, where I attend their breakfasts once a month. This is where I first heard about their infrastructure issues. Places like them are important to their community. They may need to reshingle the roof or do other maintenance things but may not have the funds. I recently introduced my bill for legions across the country and it as been very well received. We have three offices in Thunder Bay, Atikokan and Fort Frances with a 6 1/2 person staff. In a big riding like this you have to manage your budget well. It has been frozen since 2008 when I was elected so it gets tougher. We can take 60 trips back and forth to Ottawa. How are you enjoying your time as an MP? I have been fortunate in my life with having various opportunities to do different things and that is my personality. As you get older you bring all these experiences to bear so this is a good time for me to do this job. I can’t take credit for helping all the people. My staff is terrific and they help the people. It is nice when I come back on Friday to see there are thank you letters on the mantle. We have helped people through the red tape and get the services they need. We can help people get results with the Federal Government. Do you plan to continue on in the job? My intention is to run again, that is the plan now. I will be age 60 in July. It is tough job with long hours and you are away from home a lot. When you are home you are away most of the day as you are out. My kids are older now so it is easier to do the job. I wish I was a little younger to have more energy but I am enjoying myself. It is the type of job where you have to be at the right time of your life, to devote the time and to have the experience and skills you use everyday to help people.